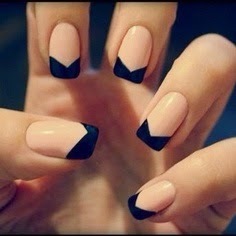 Triangle Moon Nails are one of the new trend of french manicure. 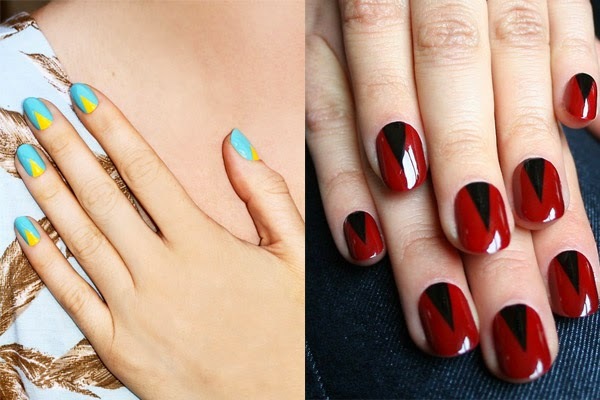 If you get bored of usual french nails and you want something new and modern.then you have to try triangle moon nails. Though the Triangle Mani employs the same basic application principles as the Half Moon design, the difference is that the circular moon shape of your nail bed is now turned into a triangle, painted in a contrasting shade to the rest of the nail. This helps create more dynamic look and elongate the appearance of the nails. Triangle moon nails looks good even in short nails.You can draw triangle shape in the begging of your if you want or at the end.This is up to you!!! !